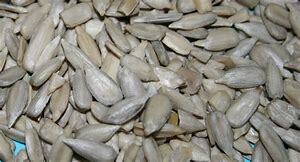 Sunflower seed meal comes from finely ground shelled sunflower seeds; which comes from sunflowers. Sunflower seed meal has lots of nutritional value and is a great way to add nutrients into your meals. Sunflower seed meal is great combined with other gluten-free flours. How To Make Your Own: Take shelled, raw sunflower seed, place in high output blender, food processor, or coffee grinder and grind until fine. Grind for about 5 seconds at a time, then check the consistency by touch, repeating the process until you reach the desired fineness. Pour into 9x5 greased pan, and let rise to top of pan (took about 80 minutes). I always, always let it rise in a turned off oven. Use egg replacer of choice to create a vegan loaf, as well as an alternative sweetener for the honey, such as molasses, sugar, sorghum, maple syrup, etc. Using rice flour and oat flour has been recommended for the gluten-free flours. Also sorghum is a great additive as well.